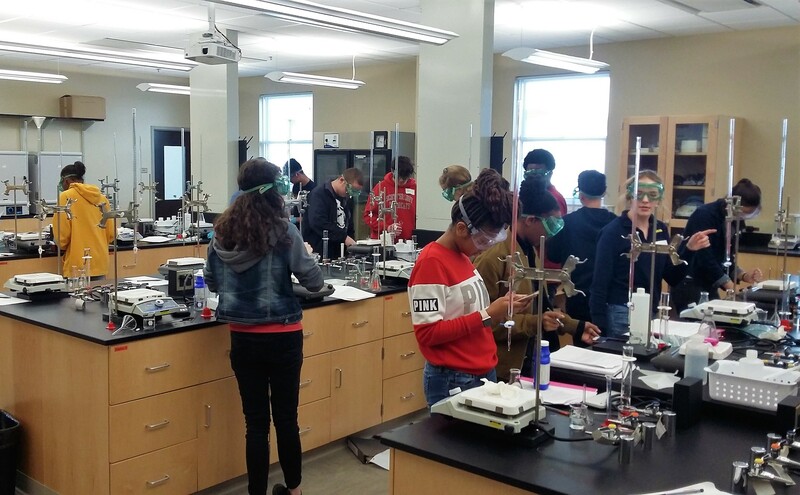 Belmont’s Department of Chemistry and Physics recently hosted “Back Titrations: Neutralizing Agents – How Basic is It,” a half-day guided inquiry workshop for advanced placement (AP) chemistry high school students. This semester, 22 AP chemistry students from Stewarts Creek High School attended. Event organizer Dr. Danielle Garrett, assistant professor of chemistry education, led an interactive discussion covering topics including neutralization reactions, titration curves and back titrations. Each student was then responsible for completing a series of back titrations to determine the effectiveness of commercial products used to reduce stomach acid such as baking soda, antacid-reducing tablets and milk of magnesia. After the workshop, students had lunch and engaged with senior chemistry student Christopher Hansen. After a campus tour, students toured Belmont’s lab facilities with College of Sciences and Mathematics Dean Dr. Thom Spence. Knowing that schools sequence their course materials in different ways, Garrett works to gear each pre-lab discussion to the group she’s working with. “No matter where students are in their chemistry learning sequence, I love having the opportunity to work with students like Mr. Vaughn’s – engaged, eager to ask and answer questions and eager to learn new material,” she said. A second workshop will be hosted later this semester for AP chemistry students from Christ Presbyterian Academy.